It’s been a while since last time I had done a strategic asset allocation. It was April 2010. During this time, there was a little change in capital index.World index, which represent global capital market, increased quite a lot, commodity index(CRB) as well. 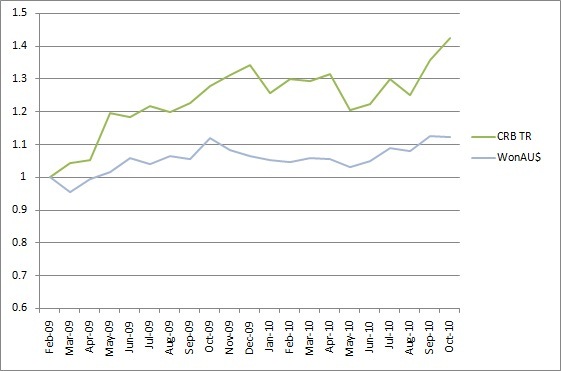 The most dramatic increase was commodity index(CRB index). 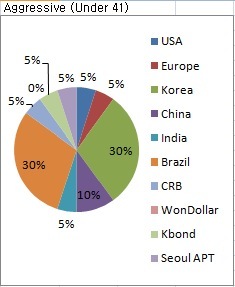 But, it was followed by strong AU$ relative to Korean Won. A big increase of CRB index make me scary in an expectation of following increase of AU$. Even though commodity index increased a lot already, considering being late of commodity index relative to the world index, I might keep enjoying the rising of commodity a little more to go.Here comes the latest strategic asset allocation model for the age under 40. 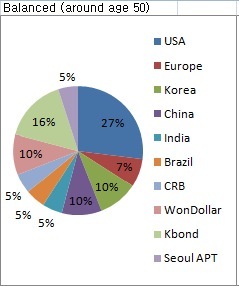 Main investment target is Korea and Brazil and expected return of this model is 9.67% and volatility is 26.35%. Frankly, I’m following this model personally. Another model is so called balance model, which might be suitable for around age 50. The expected return is 7.83% and volatility is 17.11%. I believe the life cycle theory of investment is quite reliable to pursuit. That means the risk of the investment model should applied to according to the age. The aggressive model that I suggested is, I believe, suitable for anyone who is under 40. The reason is that until the age 40 investor still have on average 15 more years to work, meaning he/she can handle relatively higher volatility than the older.